My life as a geologist started at a time before Git. Originally, I collected code in my "quarry" if I suspected I would need it again one day. Meanwhile, I hoard artifacts from configuration files, keyboard shortcuts that I can't remember for various shells, and names of tools I want to try. Usually, none of them appear on this page, because each note contains no more than a few lines of text. That's a pity, so today I'm serving up a wildly mixed selection of notes in the hope that everyone will find something new. The following line, built into Postfix's header_checks.cf, shortens the mess to a civilized re: <Subject>. not only saves a few characters, but also proves that its initiator is, first, a nerd with dubious humor and, second, no longer a young man. (The sequence iddqd enabled God Mode in the Doom shooter game in 1993). It is medicine for the "Permission denied" disease that every forgotten sudo reliably triggers and is fixed as soon as you type doch (of course!). The shell then runs the failed command again, but preceded by sudo. Typing sudo!! would have the same effect, but that requires three more keystrokes and is less cool. replaces the wrong substring. Bash runs the modified command immediately. Ah! 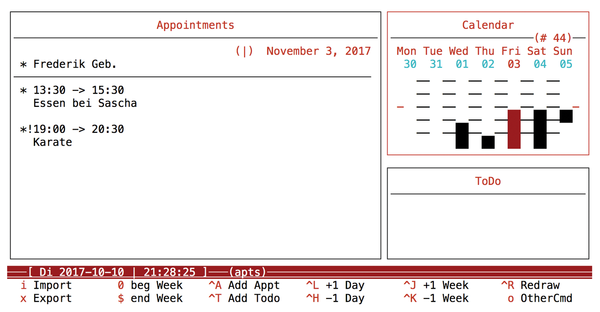 My "tools" list also includes calcurse, a console-based calendar available in almost every distribution. It imports third-party calendars in the common ICS format, supports scripting, and provides information on upcoming appointments in several ways (Figure 1). Figure 1: Thanks to calcurse, Charly didn't miss his Friday noon lunch appointment and put on his black belt punctually at 7pm. I have just found another piece of paper that says: "Change the note box to SVN." It's from 2006.